This sighting isn't from Buffy the Vampire Slayer, but I thought it was just too cool not to post. 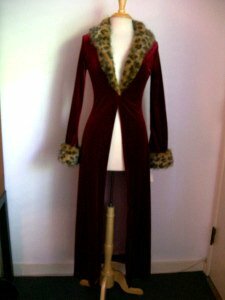 So it appears that the beautiful coat Drusilla wears in the Angel episode "Reunion" is by Betsey Johnson. I've reviewed pictures from an online vintage clothing store and the coat looks to be a match to the one Dru wears! 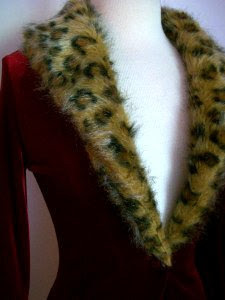 The coat is red with faux leopard fur on the cuff and collar. The red portion of the coat is made of a velvet material. Wow! So exciting to finally find a Drusilla clothing item! I've always loved her style.